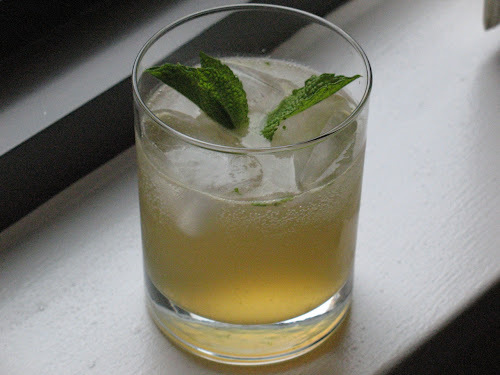 I call this drink The Backyard because it's made up of ingredients that remind me of my backyard as a child, specifically the juniper syrup, because we had a juniper tree; the mint leaves, which grew wild by the garage gate; and the smoked whiskey, since we barbecued out back frequently. Add mint leaves and juniper syrup to shaker and muddle. Add ice, whiskey and lemon juice and shake until cold. Strain into lowball glass with ice. Top with club soda. Gently crush juniper berries (a muddling tool works well). Add to medium saucepan with sugar and water. Bring to boil over medium-high heat. Reduce heat and simmer 15 minutes. Remove from heat and let mixture sit for about an hour minimum (up to 4 hours). Strain and keep in refrigerator. I've seen the backyard in the home where you grew up. It deserves a cocktail named in its honor.